WER 2018 will take place at PUC-Rio, Brazil in two auditoriums: RDC (Rio Datacentro) and Padre José de Anchieta. Connectivity: free Internet access (wireless). Lunch and commerce options: a variety of restaurants, cafeterias, bookstores and ATMs on campus. Public Transport: a large number of city bus lines make it easy to get to campus, including exclusive buses to the metro system. Taxis: taxi stand located on the right side of the main entrance of PUC-RIO (rua Padre Leonel Franca). By Taxi (some licensed taxis): JB Taxi: (21) 2178 4000, Pontual: (21) 2520-7696, Lagoa Taxi: (21) 2291-9734. By Uber, Cabify or 99 Taxi. By Subway: from Downtown to PUC it is necessary to take a Subway + Bus with one ticket of R$. 4.00. There are two stops to take the bus: Botafogo station and Antero Quental station. PUC-Rio is located in a charming neighborhood with quality restaurants and a shopping mall. We recommend the following list in order of proximity to the university. Padaria Caiçaras: Buffet with sushi options. Da casa da Tata: Home Lunch and Teatime with delicious cakes. Delirio Tropical: Variety of organic salads. Soups at night. Le Pain du Lapin: Delicatessen. La naturelle: Organic ice creams. Very tasty gluten-free pizza and hamburgers. Braseiro da Gávea: One of the best barbecue places in Rio. Casa Camolese: Delicatessen and craft beer. * Most of these restaurants are located at the main street: Marquês de São Vicente. There are only a few places to stay in Gávea; however, we found two much-recommended places: Gavea BNB and Colonial House. The two neighborhoods adjacent to Gávea recommended to stay are: Jardim Botânico and Leblon. Jardim Botânico has two famous parks nearby, and Leblon is near to the beach. At Leblon we found nice spaces in the Airbnb website. At Jardim Botânico we recommend housing between the two parks (Jardim Botânico and Parque Lage). Rio de Janeiro is traditionally one of the most popular tourist destinations in Brazil and Latin America. The beautiful beaches, waterfalls and rich culture are attractive that attest to the title of "Cidade Maravilhosa" (Marvelous City) to the capital of Rio. If you decide to extend your stay in Rio we indicate the following places to visit: Corcovado - Cristo Redentor (Cosme Velho-Parque Nacional da Tijuca), Pão de Açúcar (Urca), Maracanã, Jardim Botânico, Parque Lage (Jardim Botânico), beaches (Copacabana, Ipanema, Leblon), Trails and mountains (Pedra da Gávea, Pedra Bonita, Morro da Urca), among other options. 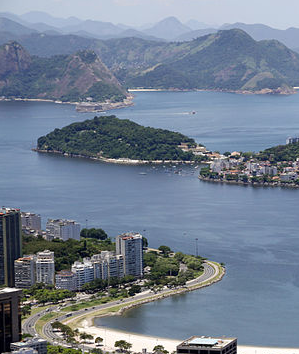 For further guidance, you may want to check the Insider’s Guide to Rio & Brasil. Public Hospitals: UPAs - Unidade de Pronto Atendimento (Copacabana, (21) 2333-9287), Hospital de Ipanema (Ipanema, (21)3111 2300), Hospital Miguel Couto (Gávea, (21) 3111-3720), Hospital Rocha Maia (Botafogo, (21) 2295-2295).